Homemade pasta. I said it. I have been making homemade paste (pastas) since I was 6. Making homemade pasta is so much more easier then you would think. Plus there is so much satisfaction that you get by being able to say that it is homemade. Once you get the base recipe down, I advise that you experiment with making unique pastas. Pastas are so versatile you can make spinach pasta, pepper pasta, black pepper pasta, chocolate pasta, any pasta! I thought that the pink peppercorn flecks would look so pretty through out the golden dough. Put the flour, pink peppercorns and salt in a large bowl. Using your fingers make a well in the middle of the flour mound. Drizzle olive oil on the flour. Pour the eggs in the middle of the well. Using a fork puncture the egg yolks and start whisking them. As you whisk, some of the flour will cave in. Use your hands and incorporate everything. Add the water to the flour mixture and incorporate it. When you press the dough with your fingers, it should stick together. If not add another tbs. Turn out on to a clean, floured counter. Your dough might be a little crumbly but it will all come together. Knead for about a minute. The dough should not be sticky and the dough should not be crumbly. Shape the dough into a smooth ball and cover with a lightly moistened paper towel for 20 minutes or refrigerate for up to 3 hours (if refrigerated let the dough get to room temperature for about 25 minuted before rolling it). While your dough is resting, set up your pasta machine (if you do not have a pasta machine it is fine, just roll the dough out by had and once it is thin enough flour it, roll it in half and cut the dough in to fettuccine). Divide the dough in half. Flatten the dough with your hands and but it through your pasta machine on the widest setting. Continuously fold the dough lengthwise and widthwise in order to stretch the glutens. Do this about 20 times. Now, without folding the dough, roll the dough through the next two settings. Roll it a couple of times on these two settings. If you want thinner pasta roll it through thinner settings. Dust with flour to keep from sticking. Now you can cut the pasta yourself or send it through the pasta cutter. 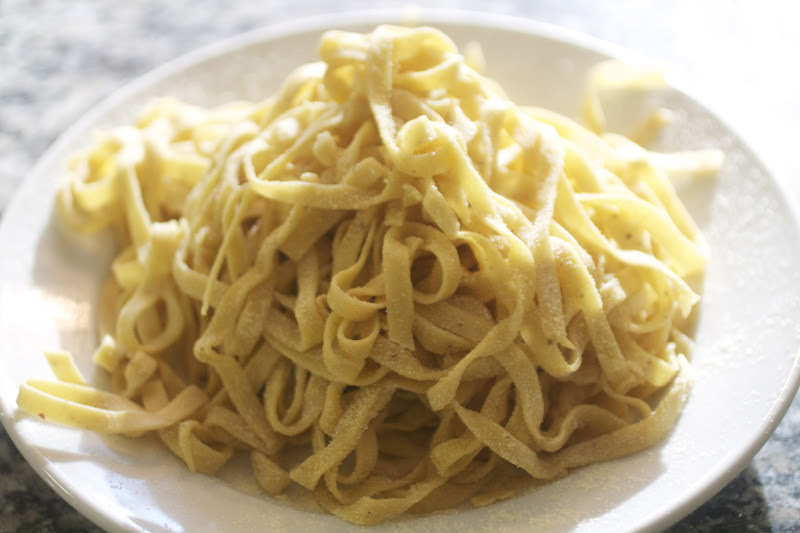 After your pasta is cut, dust with flour and form the fettuccine into nests. Do this by gathering the threads of fettuccine on your hand and twisting the long strands around fingers. Then place it on a floured plate. The fettuccine is fine like that or dry it. You can cook it right away or refrigerate for up to 3-4 days. 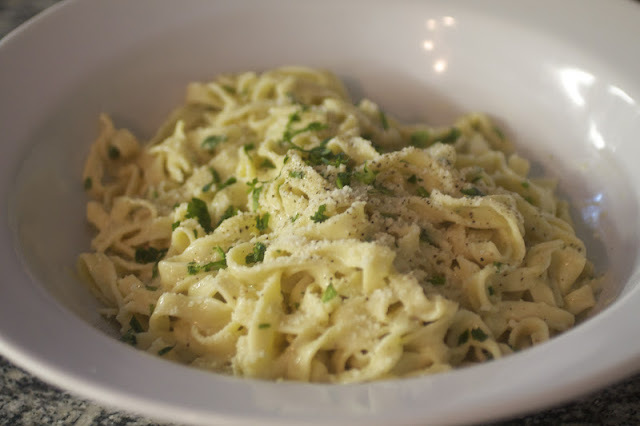 While the fettuccine is cooking in salted boiling water, mix together all the ingredients in a bowl. Reserve some of the pasta water and drain the fettuccine. Put the fettuccine back in the pan with the sauce and mix together. Add some pasta water if needed and serve. Top with more cheese, pepper and parsley.